Is the coast clear? These giraffes checked out their surroundings before greeting us. I've been reading lately about the world's tallest animals and discovered that they give birth while standing up (the newborns fall five feet to the ground), have 21-inch-long tongues, chew their regurgitated plant-matter cuds (and have four stomachs) like cows, and despite being 14 to 19 feet tall have the same number of neck vertebrae as we humans and most other mammals do (seven). Unlike us humans they can't cough—presumably the only reason you haven't seen a hacking giraffe in what would have been history's greatest Halls commercial. Visiting a zoo always brings mixed feelings, but Pamelia and I can't pass up the thrill of seeing some of the planet's great (if confined) creatures. The nearly 200-year-old London Zoo houses 16,802 animals, from 755 species, and we couldn't stay away. In hopes of gaining a new perspective—by doing things like mucking out zebra stalls, feeding chopped carrots to the giraffes and helping tend to the monkeys and tigers—we attempted to become zookeepers for a day. It didn't work out on this trip, but we'll be back for another try. This African purple glossy starling gave us a chatty earful and a yellow eyeful. The iridescence of its feathers comes from light hitting specially structured granules of melanin, the same pigment that largely determines human skin color. I suspect we would be rather scary looking if our skin were iridescent and we had irises the color of New York taxis. This Victorian-era post box at the zoo now begs not for mail but for donations to save tigers. The latest National Geographic has an excellent section on how we might yet save not only the world's desperately endangered tigers but also other big cats. This Sumatran tiger snoozed through our visit, but presumably would be pleased to know that the zoo is building a much larger tiger enclosure that will try to recreate an Indonesian rainforest environment and will open in early 2013. 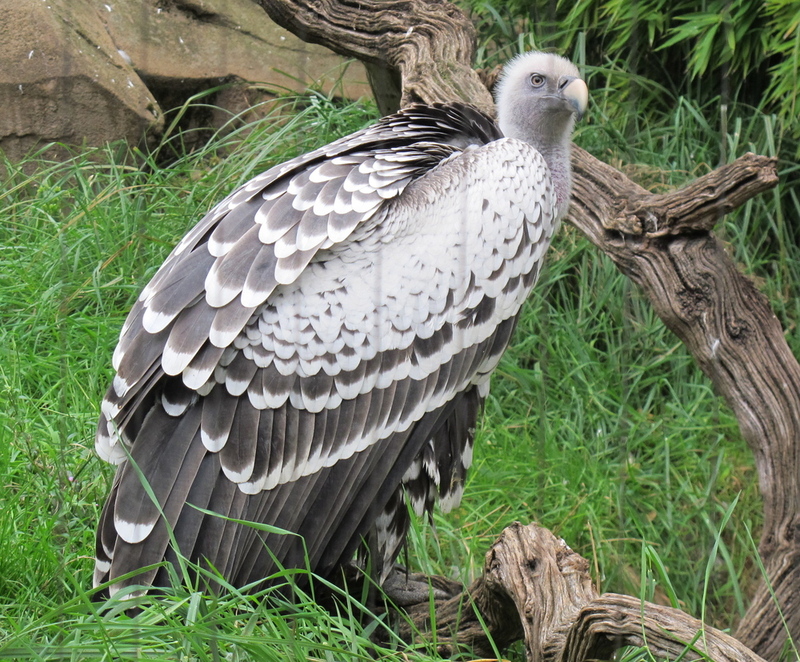 We tend to think of vultures as ugly, but this Ruppell's griffon vulture, a native of Africa, had an elegant beauty. In the air these birds are even more remarkable: A Ruppell's holds the record for the greatest flying height ever recorded by a bird—one collided with an airplane at 37,000 feet. I made this same comparison with my hand last year at the California Academy of Sciences in San Francisco, but I couldn't resist. The zoo is part of an international breeding program for western lowlands gorillas like this contemplative character, who seemed to yearn for something more than the climbing ropes and sheets at his glassed-in home. This is a terrible photo (camera focused on the fence), but the color of these scarlet ibises was phenomenal. Here's the mechanical bird clock in front of the zoo's Blackburn Pavilion. You have to check out the video below that we shot when the clock struck 4 p.m. We missed the very beginning but stick with it to the end, when more things happen.